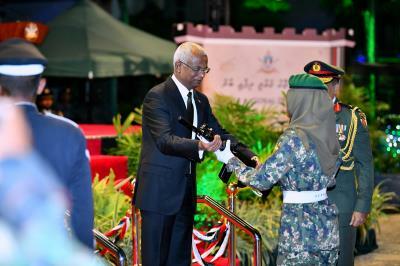 Commander-in-Chief of the Armed Forces, President Ibrahim Mohamed Solih has called upon the Maldives National Defence Force Officials who completed the basic training program and took oath this evening to be steadfast in taking civic and security responsibilities which are covered in the duties of the Armed-Forces and expressed assurance for them to be fully acquainted with the military etiquettes. He stated this while speaking at the Oath Taking Ceremony of the 64th Basic Training Program of Maldives National Defence Force held at Kalhuthukkalaa Koshi. Speaking at the ceremony President Solih stated that even if an individual serves the military for a brief period of time, that person will remember the values of being a soldier for life and that the past 127 years of the long military history of Armed-Forces ensures that Maldivian soldiers will never be traitors. Speaking in this regard, President Solih emphasized on the importance of a strong Armed-Force in ensuring the independence and sovereignty of the country. However, he stated that the most important purpose of any soldier should not necessarily be focused with fighting or winning wars and that it would ultimately give more pleasure to serve the army through securing peace and harmony in the country. Moreover, President stated that the Maldivian Armed-Force is one of the main reasons that Maldives is able to peacefully co-exist with the rest of the world. President Solih also commended on the invaluable services provided by the Armed-Forces in maintaining internal peace in the Maldives. Speaking in this regard, the President also underscored that Maldives National Defence Force is one of the first institutes to always be there to help the Maldivians in times of crisis and expressed heartfelt gratitude for services rendered to the public. Moreover, speaking at the ceremony President Solih shed light on the fact that the administration is working on improving the welfare options available to the families of MNDF officials and stated that the administration recognises that, just like civilians, MNDF personnel also struggle with attaining affordable housing and therefore stated that the administration is working on speeding up the progress of the SIFCO flat project which is especially dedicated to the Armed-Force personnel. Moreover, the President shed light on the work carried out by the administration in further seeking training opportunities from friendly countries for the Armed-Force personnel to ensure that they are trained, sharp and fit soldiers. 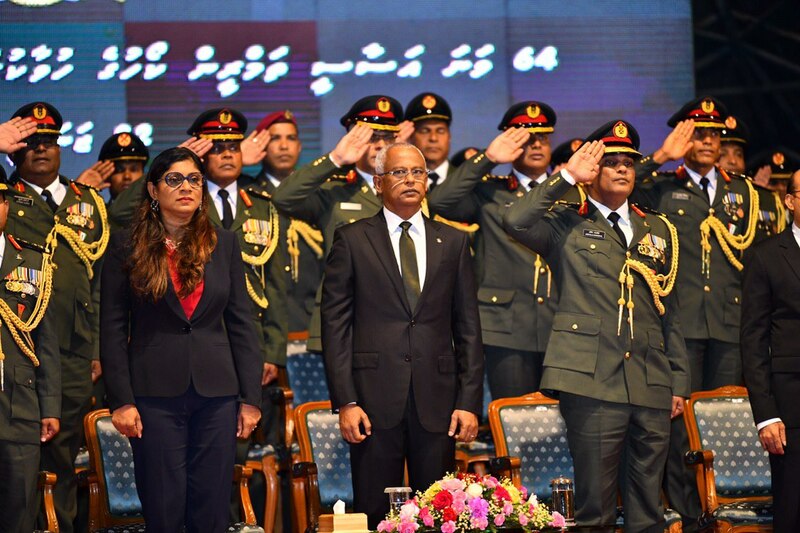 Furthermore, President Solih stated that the MNDF personnel should be exemplary figures to the public in upholding the laws and regulations of the country. He also stated that as per the code of ethics of MNDF, all personnel should have a single belief system and remain steadfast in the Islamic faith, put forward the country’s welfare and assist in maintaining and following the rule of law in the country.